Where is your shop on the timeline? 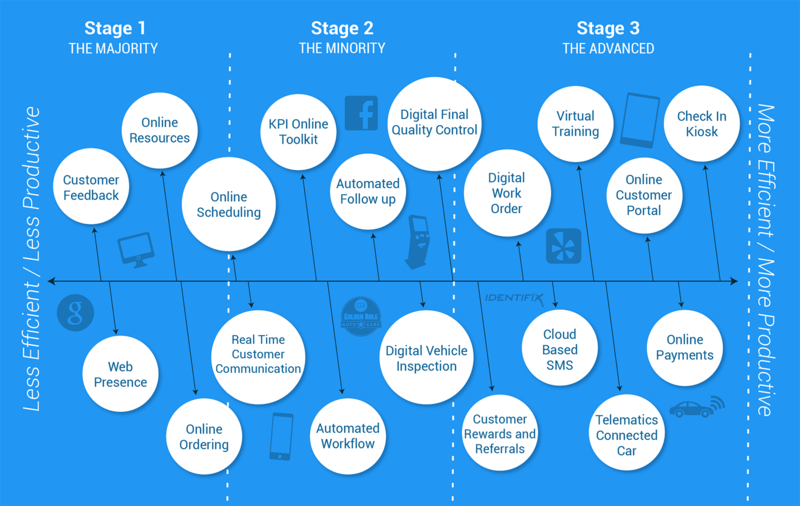 Why do we want our automotive repair shops to be far along the technology timeline? As automotive repair shop owners, we want to increase productivity and improve efficiency, which lead to a strong bottom line. We also enjoy enhancing our customer experience, and now that we all offer a free bottle of water, we need to make a bigger impact. We need technology to help build our competitive advantage to separate us from the rest of the pack. Where is your automotive repair shop on the timeline? Technological advances push us forward whether we’re ready or not. 90%+ of our population now carries a smartphone, whereas 10 years ago, it was less than 10%. The majority are the shops that react to technology as it comes because they have little choice. Shops in Stage 2 know they need to embrace technology. They leverage it in their day-to-day operations. They are willing to adopt technology on the market that works and even attempt some technology that doesn’t. These shops are the 1%. They are early adopters of new technology as soon as it hits the streets. They understand that new solutions will not be perfect, but the advantage they get from using them creates a gap that others can’t touch. Use freereviewmonitoring.com – Free site to help monitor customer feedback. Claim your Google and Yelp business pages. Facebook – Create a Facebook page, forget the other social media platforms, and post personalized content. Increase your productivity and profits in your operation! Adopt technology sooner rather than later. Don’t be compelled to adopt because your competitors force you to. Create a gap for other businesses to follow. Don’t get overwhelmed. Change is good.